CRAIG MacGILLIVRAY’S hopes of ending the Scottish snooker season with victory in the Scottish National Masters Championship were dashed when he lost 5-2 to Glasgow’s Pat McKinney at the Minnesota Fats Club in Glasgow. 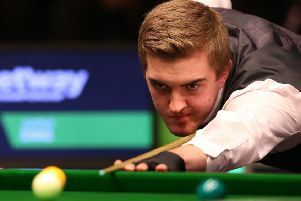 The first four frames were shared, with McKinney making a break off 88 – the highest of the match – to win the third before McGillivray won the next to level at the interval. The fifth frame proved to be a pivotal point in the match. MacGillivray led by 33 with three reds remaining before McKinney fought back to steal the frame on the black. He then went on to win the next two frames to pocket the title. Despite the defeat, MacGillivray still ended the season No.1 in the Scottish Masters rankings.